Food from a truck: No longer scary! Seventeen of your favorite food trucks, live music and beer. That's... pretty much all one needs in life, right? Yep. And so Truckeroo kicks off the first of its recurring fests this Friday, June 3. 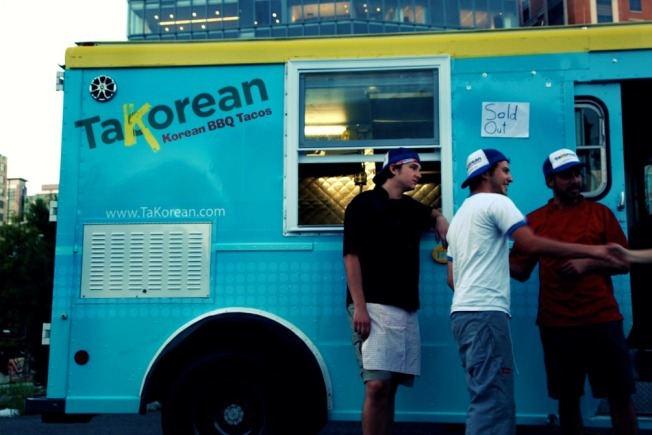 Food trucks including TaKorean, BBQ Bus and Sweet Bites will be parked between the Bullpen and Das Bullpen near Nats Park in Southeast (at the corner of Half and M streets) from 11 a.m. to 9 p.m. Grab a bite to eat and then head over to the adjacent Bullpen to enjoy a beer. Also catch live bands Sean Chyun & The Deceivers (noon-3 p.m.), Anthony “Swamp Dog” Cliar (3-6 p.m.) and White Loafer (6-9 p.m.) for rock, blues, reggae and soul. Curbside Cupcakes co-owner Kristi Whitfield -- also the executive director of the D.C. Food Truck Association -- said such events showcase the food truck culture and give support "to making D.C. relevant in a movement that's happening in other places." "The food trucks love being together," Whitfield said, anthropomorphizing the whimsical vehicles (and who wouldn't?). "It's fun for us; it's fun for our followers." Does this mean no hard feelings when someone chooses a Dangerously Delicious caramel apple crumb pie over a red velvet cupcake? Exactly. The trucks live by the friendly mantra "BRING IT," and welcome the opportunity for people to taste different foods, Whitfield said. The festival will run once a month through October. See the full list of participating trucks here.